Mix the flour, semolina, salt and sugar in a bowl. Add the water and oil, knead to form a smooth dough. Divide the dough in half, shape into two balls, flatten both pieces a little, dust the work surface with semolina and roll the dough out thinly, place on a baking tray lined with baking paper, prick firmly with a fork. In a blending cup, puree the beans with all the other ingredients up to and including the pepper. Spread the topping over the dough base and smooth down. Approx. 20 mins. on the bottom shelf of an oven preheated to 200°C. Thoroughly mix the almond butter with all the other ingredients up to and including the pepper, set aside. Heat the coconut oil in a non-stick frying pan, stir fry the courgette and asparagus for approx. 3 mins., remove from the pan, allow to cool slightly. Remove the pizzas from the oven. 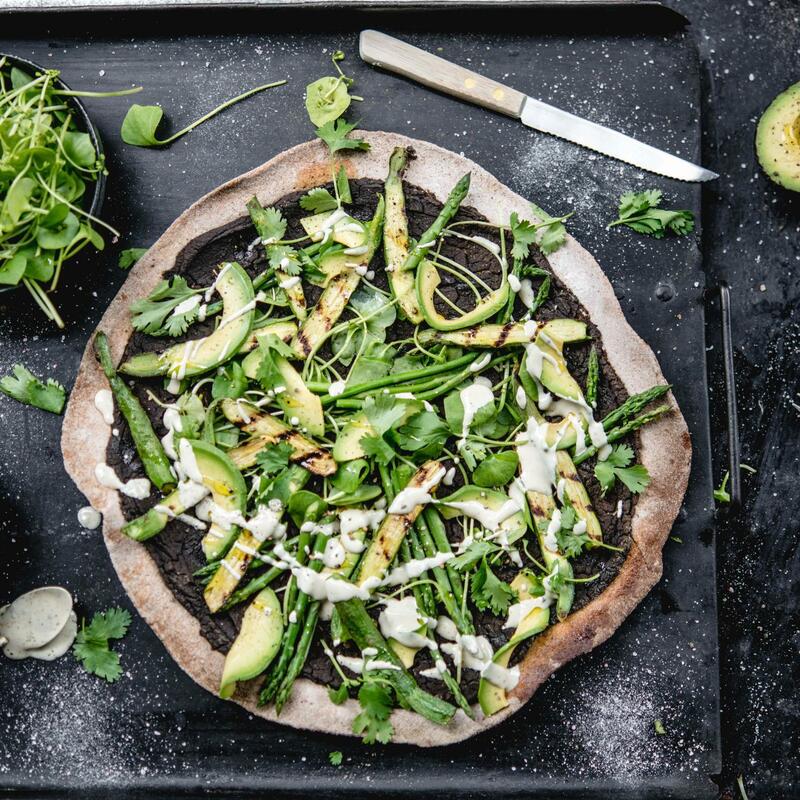 Top with the vegetables and avocado, drizzle with the reserved almond & lime dressing, garnish with the coriander and enjoy immediately. The pizza dough can be wrapped in cling film and stored in the fridge for approx. 2 days. It can be used for all kinds of pizza bases and flatbreads.